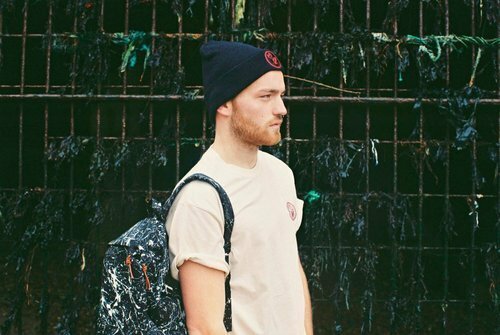 From humble beginnings in Southsea and the borders of south London, Camera Fund are one of the hidden gems in the ever growing market of UK based indepenendent clothing lines. Having just released a high quality range of garments for it’s winter collection, we caught up with one of the owners – the hugely talented photographer Hollie Fernando. What is Camera Fund, and why did you choose to name it that? Camera Fund is a small clothing line run by Mikey Scanlan and myself. It started out as an actual camera fund project! I have constantly been saving for better cameras and my fellow creative Mikey was sick of me whining and spending so we came up with the idea of making clothes to sell to help me save for my cameras and for his wants and needs too. We always used to make our own and get all our mates begging us to make them ones too so saw a little niche. So essentially it was just that, but it all became bigger than we ever pictured! Now I have a few amazing cameras from it but a photographer’s kit is never complete, so onwards and upwards! Who is involved in CF and who does what? Mikey and I are the big men, and then we have a range of young up and coming artists that help us with designing etc. Other photographers are starting to get involved too, such as Katie Silvester who shot one of our lookbooks for this drop. In the future I want it to be a creative collective as much as a clothing line! Aspiring creatives need more exposure and what’s better than sticking their drawings on our tees and letting them run wild with the products on a photoshoot? I know I have appreciated the same kind of exposure in the past so I’m paying it forward. When did you guys start? And How? We started with one big batch of tie dye tees a year or so ago that we flogged on facebook with ‘first comment wins’ rules. The sales from those bought us the next batch of tees and dye etc and on it went from there! It’s very cool to see how much we have grown thinking back to the beginning. Who designs all the graphics/logos? A collection of people have been involve from the beginning, it’s great to have so much support! Big thanks to Josh Magee for the logos and fonts for this release and Zoe Kelly for a mind blowing illustration. Illustrator Connor Annal’s moment to shine is approaching with the mid season release, keep your eyes peeled! So, you’ve just released your winter range, what would you like to tell us about that? This range is playing a lot on the fact I run half of it from London and Mikey runs the other from Southsea. Having that concept within the clothes really keeps us down to our roots as we are still letting people know what we are all about and how we started out. There are just some snugly bits for winter, some lovely simple t-shirts and a few backpacks. Oh we also kept in the big selling chill tie dye shorts from the summer. I wear mine as pjs and Mikey wears his as boxers, they are so cool. What’s the best thing about being an independent clothing brand? Most popular products from your last release? The splatter and creeper tees were a big hit! Flew off the shelves throughout. Mikey spent all summer hunched over flicking bleach and constantly had black fingers from the dye (you should see his decking, woopsie). Potentially could be back in some shape or form over the next couple of months so if you didn’t snap yours up yet you still might get the chance! We have a few exclusive tees and bits coming out mid season, illustrator Connor Annal is designing something really cool, we are very excited to be working with him again (he drew the wolf on our first ever screen printed tee). Other than that we are going with the flow, this is just a project to sell clothes we like to wear ourselves. We don’t want Camera Fund to be seen as another try hard streetwear brand which is why we are leaning towards becoming more of a creative collective too!